First, I am not a huge fan of Gil Kane's work. In fact, I think he drew the ugliest Superman ever. However, he is a noted Conan artist, and being a huge Conan fan, this page really appealed to me. You'll note that it's not really a battle action page, but the composition and linework is gorgeous and the bottom center panel really sold me. 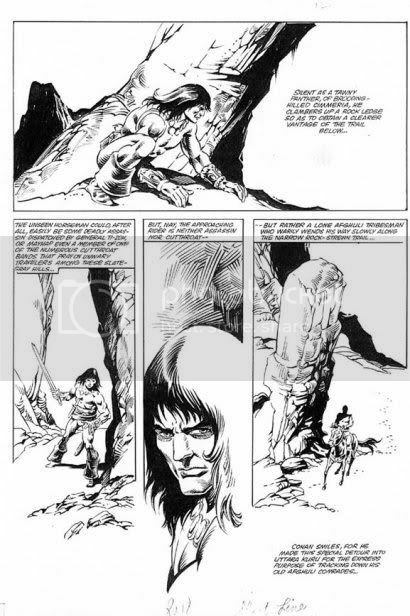 From The Savage Sword of Conan #85, page 12. According to the Grand Comics Database, this page was inked by either Danny Bulanadi or Nestor Redondo. If anyone knows for sure, please leave a comment.